I’ve been on kind of a kick lately, in trying to clear out old food from my freezer. At least a year ago, I bought a 1pound bag of frozen Bird’s Eye cauliflower. Why I bought it is beyond me, since I really don’t care for cauliflower to begin with (since it’s easy to overcook cauliflower), but I’ve got to make it into something. Well now that Fall is slowly transitioning into Winter, I though that it would be a good time to make some soup to warm my bones. But what kind of soup did I want to make? This is when the “freezer rejects” get brought into the picture, with the cauliflower leading the pack. 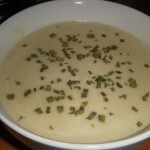 After a little bit of recipe searching on my bookshelf, I happened to have a Cream of Cauliflower soup recipe from King Arthur Flour. 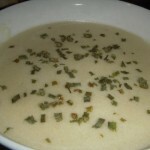 I have to say, I had pretty low expectations on how this soup was going to turn out with my freezer burnt cauliflower. But I’m pretty happy with the results. 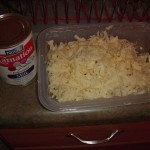 1) This recipe called for sharp cheddar. 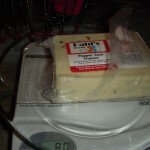 But I already had a ~9.5 oz block of Pepper Jack cheese so I used 8 oz of that block instead of cheddar cheese. I thought that it added a nice bit of heat. 2) Instead of white wine or sherry I used a 1/4 cup of Bud Light from the free keg. 3) If you follow the steps in the original recipe, more then likely your roux will break in the end, since it happened to me. 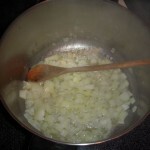 Next time I would cook the onion in a little bit of olive oil instead of butter. 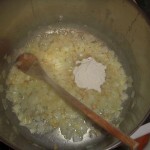 Then after the soup is done cooking, I’ll make the roux separately and add it at the end of the recipe, instead of in the beginning of the recipe. 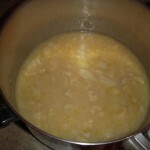 4) Instead of 24 oz of chicken stock, I used a whole 32 oz carton. 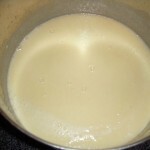 5) I’m totally using evaporated milk from now on when making a “cream of” soup. Since it is much easier for me to have a couple of cans of evaporated milk on hand, instead of a small carton heavy cream or half & half. 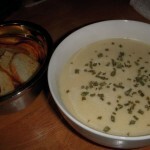 6) Bagel chips make a great dipping companion with the soup. I’ll have to give the cornstarch a try next time around, since I’ve got a whole carton of cornstarch sitting in my kitchen cabinet. I also have a small container of Arrowroot, but who knows how old that stuff is for sure. I think part of the reason your roux broke is because you didn’t have the added fat from the cream. 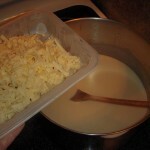 I really like using evaporated milk as well, but I typically use a cornstarch slurry with it as a thickener instead of a roux. No risk of breaking and it saves a lot of fat calories for a small sacrifice in flavor.